A group of highly dedicated individuals who have worked within the US Center for World Mission as board members, community members, employees, collaborators and founding innovators realized that the current leadership was intent on betraying their covenants with the donors and selling the US Center for World Mission / William Carey International University Campus. This Save The Campus Team has mobilized to use every means possible to stop this tragedy from happening. Once this Campus is sold it will be gone forever. In Pasadena, both Real Estate developers and the City of Pasadena itself are hungry for the increased revenue a sale like this could bring. For over 107 years this Campus has been dedicated to spreading the Good News of Jesus to every nation. There is NO guarantee that if this Campus is sold that it will go to another Christian organization that will continue this vision. The Save The Campus Team is wholeheartedly dedicated to the preservation of the original vision and the restoration of the hope and passion that a truly collaborative community of people who follow Jesus can bring to the World. the deceptive gears of spin always get stopped by the faithful chords of truth! It is critical at this time that we learn to discern the difference between the real truth and the spin created by current Leadership of the campus. "Frontier Ventures’ purpose for a sale of a portion of FV’s property is to make the best and most effective use possible of our resources for the vision God has given us." Oh, and another small detail Fran Patt keeps forgetting to point out. Those 56 homes they are selling are primarily where the Micronesian community lives. That community has lived and worked on this Campus for almost 40 years (4 decades). Selling the Campus will cause them to lose their jobs, their homes and their close knit community. They will be scattered as family groups and as a community. But for Fran Patt and Mr. Kevin Higgins (the new WCIU President) this is just A SMALL PORTION OF THE PROPERTY! Gentlemen, let's at least get the math correct! You are selling 100% of the Campus and 38% of the homes! This in most people's minds would NOT constitute "A SMALL PORTION." I will therefore categorize your SMALL PORTION statements as SPIN and not TRUTH! This entire section of the website will be devoted to challenging the statements the US Center for World Mission dba Frontier Ventures and William Carey International University leaders keep making to the public that are FALSE. Our goal here is to EXPOSE their Campaign of Spin in order to deceive their own members, collaborators, the employees and especially those Pesky Donors that just wont either die off or go away! Feature 1 ~ truth vs spin "We're not really selling"
Below is the article that the Save The Campus (STC) Team posted on their Facebook page on March 9th, 2017. The STC Team Members who wrote the article, and made additional posts were ridiculed, called High School Gossips and even called liars! By the way WE SAVED these very embarrassing public comments by the US Center for World Mission (USCWM) dba Frontier Ventures (FV) and William Carey International University (WCIU) leadership. They made statements saying that the Boards were making no plans to sell the Campus and that they were ONLY EXPLORING the idea of a sale! We are only 8 months past those statements and they have ALREADY accepted an Official Offer! Truth vs Spin, I will let you decide. Please review the article below and decide for yourself who was telling the truth! March 9, 2017: Sad day for the global mission community and the 6,700 remaining unreached people groups. Today Fran Patt and Greg Parsons announced to 150 people at the weekly Frontier Ventures staff meeting that the 17-acre Pasadena campus that Dr. Ralph Winter founded 40 years ago would be put on the market soon for sale. This was the first official announcement of the campus leadership's intent to sell the campus focused on unreached people groups. Frontier Ventures will keep Hudson Taylor Hall and some of the 150 houses around the campus. This FB photo is a powerful reminder on the Pasadena campus. 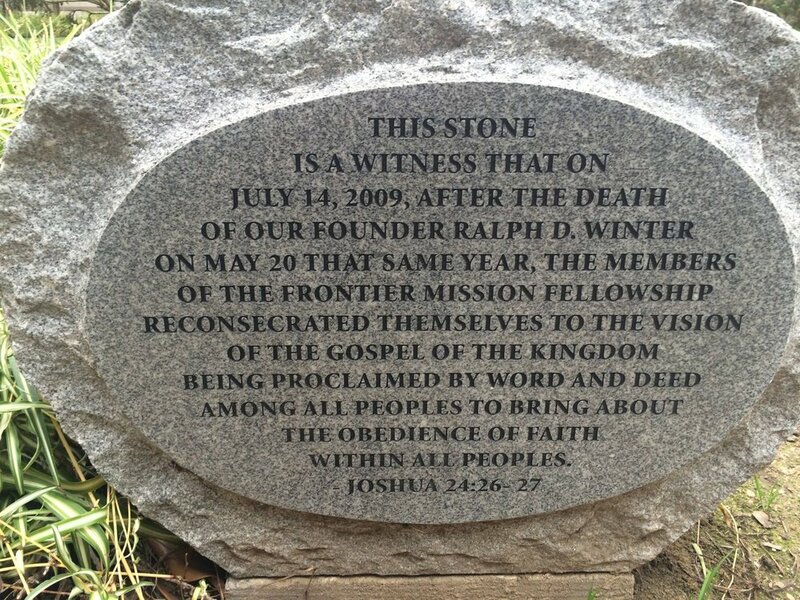 It was the stone created by the members of Frontier Mission Fellowship (now Frontier Ventures) at the death of Dr. Winter on May 20, 2009. The members "reconsecrated themselves to the vision of the gospel of the kingdom being proclaimed by word and deed among all peoples to bring about the obedience of faith with all peoples." The scripture verse at the bottom of the memorial stone is Joshua 24:26-27 which reads: And Joshua recorded these things in the Book of the Law of God. Then he took a large stone and set it up there under the oak near the holy place of the Lord. '"See!" he said to all the people. "This stone will be a witness against us. It has heard all the words the Lord has said to us. It will be a witness against you if you are untrue to your God." IN THESE NEXT 40 YEARS, let's hope this Pasadena campus just doesn't become another Christian college campus as there are already 570 US Christian college campuses in the US. IN THESE NEXT 40 YEARS, let's hope this Pasadena campus just doesn't become another think tank that generates research papers as there are already 1,835 think tanks in the US. IN THESE NEXT 40 YEARS, let's hope this Pasadena campus just doesn't become another real estate property that generates financial gain for a temporal season. Let's hope that IN THESE NEXT 40 YEARS that this Pasadena campus CONTINUES to be a campus FOCUSED on getting that unreached number from 6,700 down to ZERO. At last check, this was the ONLY CAMPUS OF ITS KIND focused on this specific GREAT COMMISSION task. Feature 2 ~ truth vs spin "would the real story please stand up!" This article was posted on the Save The Campus Facebook Page on September 20th, 2017. It was posted here to point out that when you try and deceive people with multiple stories, the TRUTH keeps rising to the surface. In this article you will see that the new President of WCIU states that the process of the sale would be a SLOW PROCESS. This completely contradicted what was stated in a public meeting (an Open House) for the parents of children in Judson International School. At that meeting everyone was told it would be a FAST ESCROW, not "A SLOW PROCESS" as President Higgins indicated after the meeting. President Higgins made this statement in an email and the STC Team has a copy of that email! Again the STC Team was ridiculed for making this Facebook Post. This was ONLY TWO MONTHS AGO, and both Boards (USCWM-FV/WCIU) have ALREADY ACCEPTED an Official Offer! Will they be in escrow by the end of November, or early December as stated to the Judson parents and staff? The STC Team hopes they won't, but all indicators are pointing to yes! So what was the long, SLOW PROCESS President Higgins was talking about? President Higgins is on the Board and a member of the Office of General Directors (this is like a CEO in most corporations), so he certainly knew what was going on and what was going to happen. So what was his statement all about? In a word, SPIN! When it comes down to TRUTH vs SPIN with this leadership they consistently choose SPIN! But WHY? Maybe there is SOMETHING they don't want you to know! Read the article below and see if you can notice for yourself the inconsistency of their SPIN! Would The REAL Story on The Sale of The US Center for World Mission Campus PLEASE STAND UP! Less Than 4 weeks ago the USCWM/FV leadership told the shocked parents with children in Judson International School that the campus would be in escrow by the end of November, or the beginning of December and it would be a FAST escrow! They also said, there were 2 potential buyers, but they weren't going to tell anyone who the potential buyers are until they're in escrow with one of them. A few days after the announcement at Judson School, the president of the William Carey International University, Mr. Kevin Higgins, sent out an email to the entire WCIU Academic Team telling them that there are seven or eight buyers and it will be a SLOW process determining who's going to buy which part of the Campus, but for sure it wouldn’t be RK Capital Group the real estate developer that has been all over the campus lately. Perhaps, President Higgins does not understand how real estate developers work. They almost never purchase property through their own business entity. They almost always purchase the real estate through another business entity they create like an LLC, a Limited Partnership, or a Real Estate Investment Trust (REIT). Don’t be surprised Mr. Higgins if this new entity has a very Kingdom sounding name like Covenant Community Condos, or Jesus Loves Me Apartments. Then there was the statement to the Frontier Ventures Ministry Members telling them that they were still “contemplating” selling and weren't sure who the buyer(s) would be. FAST ~ SLOW ~ STILL CONTEMPLATING ~ 2 BUYERS ~ 7 or 8 BUYERS ~ NOT SURE IF THERE ARE BUYERS ~ THEY WON’T TELL UNTIL THEY ARE IN ESCROW! WOW! The confusion is coming out of their own mouths! Now they come out with this post that seems like an attempt to coordinate all of the versions of the "TRUTH" that they have disseminated! They are publishing this only weeks before the property is scheduled (according to their announcement) to be in escrow! Below is the first comment on the USCWM-Frontier Ventures website. It is by a man who grew up on the campus, who knew Dr. Ralph Winter intimately and is a very credible witness in this situation. He is writing here as Dr. Ralph Winter himself. “It was always the vision of Ralph Winter to be just one center among many, that is why he called it the US Center for World Mission. The idea was that there would be many centers around the world linked through a global network. The USCWM would be just one among many, and dozens of such centers were formed in many countries. The property was to be an endowment for the ministry, and it did generate several million a year. At one point the board wanted to sell all the houses and Ralph threatened to resign over this. It meant that much to him to have a missional community. What Frontier Ventures stewards in Pasadena is very unique, especially in the LA area. It would be almost impossible to replicate once they sell it. The truth is Ralph would be very opposed to the sale of the campus! Yes, he was pragmatic, but so pragmatic that he would recognize this for what it is: A final coup against the vision God gave him. That vision was to establish a collaborative mission center and community. It came about through miracle after miracle as God provided. Many argued against the need for a big campus back then. But faith prevailed, and God backed it up. Feature 3 ~ truth vs spin "the evidence is in"
We at the Save The Campus Team find it very interesting that we are the ones constantly being accused by USCWM-FV and WCIU leadership for telling half truths and spreading rumors and miscommunications. They have stated that Bob Coleman's article below is a half truth and a miscommunication. We at STC know these statements by the FV-WCIU leadership are not TRUTHFUL and we can prove it! We can back up the information in Bob's article with information we received directly from the Office of General Directors and the Board of Directors. In other words the STC Team has the smoking gun! So as you read Bob's article please keep in mind all of the spin that has been stated about this article. What you will discover is that when you consider Bob;s writings below you will realize what the TRUTH vs SPIN. BOARD CASHES IN FOR $55 MILLION! Well....the evidence is in, the deed is done, the USCWM campus is being sold for a pot of porridge. We have to take our best guess – the board is now on lockdown: no talking allowed. So, we don't know who they sold to, we don't really know for how much, but our investigation indicates that it was for probably about $55 million and that the campus WILL NOT continue doing cutting edge frontier mission work, ever again. The board feels they have to be highly secretive, much like a cult, to protect this sale. They don't want any pesky input from the public stakeholders, like donors who might feel upset about a sale or current staff who were told they had “many months” before a sale would happen. Later, the board won't mind having upset the staff and donors, after the sale is finalized and can't be ever undone. For now, to tell the public would just add confusion on the board, and God knows the board is already confused enough. The chairman of the board of Frontier Ventures, Fran Patt, said it best: “We have so many insurmountable legal problems, Bob, that we have no choice but to sell immediately.” Come to think of it, my phone automatically records conversations, so I could go look up the exact wording—but that was the gist. I've been very silent here on the Save the Campus site for a while. Why? Because after studying 1 Cor 6 carefully, I concluded that God would have me first work very hard to re-establish old friendships with board members, engage them in deep conversations both written and verbal, reason with them and help them remember what they used to know: that God has done great things through this campus and can do much greater things in the next 40 years; that the Mission Pentagon God established here is still vitally needed; that we had all made promises to donors (and to God) during the Last $1000 Campaign that would be violated illegally and immorally by selling the campus. The board received me warmly and talked willingly all through this month. Talked...but with few exceptions, never engaged on the actual issues. Only one ever engaged with me to dream about the amazing projects that the campus could collaboratively initiate and incubate to the benefit of all frontier mission agencies. The others, LITERALLY, said: “I'm working on project _________. My project doesn't need the campus. Therefore, I am voting to sell the campus.” It's amazing! They're working on wildly fruitful projects started on the CAMPUS 30 or 40 years ago, yet they can't imagine that God might want to start more collaborative projects that would bear even more spiritual fruit. OK...this post won't be 5 pages like the others. There's no time! We've ALL got to get busy now! We likely have only 30 days. (They're doing an unusually short escrow as well, I've been told by insiders, so those pesky donors, again, don't have time to fight it.) But we DO have time! If you care about the campus, contact your friends! Contact any newspapers you know! Send tax-deductible donations NOW to Save the Campus so we can immediately get an injunction to stop the sale. That will cost $100K, not because of our lawyer but because we have to do a lot of official depositions—of all the board members and senior staff, of many former donors, of former and current staff and board—and the court charges a fee of $2000 average for EACH of those, to pay for a court reporter. Then we have to pay for a forensic audit, because the biggest mystery is still unsolved: how can a board of directors, even one as obtuse as this one, not be able to financially handle a campus that has NO mortgage and tiny property taxes? HOW?? What's going on? I talked with the board member who's “in charge” of finances, and he couldn't answer a single detailed question. He just showed me an audit—but refused to allow me to take a copy with me. So, it'll take money in order to mount a sophisticated and successful injunction against the sale; please consider your part in that. Any donations you make can be returned, I would imagine, if we're successful, because the board will have to pay court costs. In the end, the board will have to go. The injunction will press for that as well. It's not because they're mean—they're not, they've been very warm to me during this month of conversation. It's not because they're not faithful, because many of them are involved in other projects that are very, very important to frontier missions. It's simply because they have no vision for the campus itself, the thing the donors gave their money to, and they apparently have no skill at managing it. By voting to sell the campus, they've PROVEN that: They don't have any vision for the campus, they can't think of any reason to keep the campus, and they can't manage it, so they see no choice but to sell. They've also apparently gotten themselves embroiled in tough legal problems. But it's just not fair that people would insist on occupying a seat on the board of a ministry they have no vision for and is too overwhelming for them—while others of us (some who were former board members) are filled with vision for it and ready and willing to continue its amazing 40 years ministry for another 40 years or more, but are being kept out by a board that won't graciously offer their seats to others with vision and energy. It's simply not fair, not just, not right, and the injunction will have to address that to truly solve this problem. By the way, this HUGE decision, forever irrevocable, is being made by five people; one board member is strongly against the sale and they are rolling right over him. Let's get moving! It's illegal to sell the campus because of donor promises. It's immoral to sell the campus because of God-promises. It's short-sighted to sell the campus because there are so many, many unique contributions it could still make in God's strength towards reaching the unreached—not to mention that financially, they're not going to find a better investment for the money they receive than investing in a campus like ours that is paid for and has property taxes from the 1970's. Please....let's get moving. Send in donations to fund the injunction, and tell everyone you know, and let's not let this board get away with it. They clearly care nothing about God's campus purchased with blood, tears, toil, great faith and great prayers and God's GREAT AMAZING GRACE. Please let's not let them win this simply by our doing nothing this month to stop it. “Yet That Hour, Maybe, Is Not Now Far Away. The Nameless Enemy Has Arisen Again. where the Gospel has not yet been planted. It depends upon a new uprising of the faithful. with the purposes of God. Is this perhaps the hour...? I'll post the whole ad in a later post; I cried as I read it and remembered those days when even Perspectives, which is now a mighty program that reaches more people for missions than even the huge Urbana conferences, hung in the balance. Faith was our only evidence of a great unseen event when the campus would finally be paid off, when the number of Unreached People groups would begin to be steadily ticked down. If you had told me then that one day I would be fighting the board of directors over the sale of that campus, our campus, that precious campus so many of us gave our lives to, the one Erik Stadell had seen in a vision as a World Mission Center until the Lord returned, I would have told you you were crazy. Yet here we are...in that very battle for the survival of arguably the most unique and important frontier mission collaborative center in the world. Please join us in the fight. Please send your donations. We're ready now to do the injunction against the sale; all that stops us is funds. Please pray about your part, quickly. 1985 FB photo of Bob and Doris Coleman. 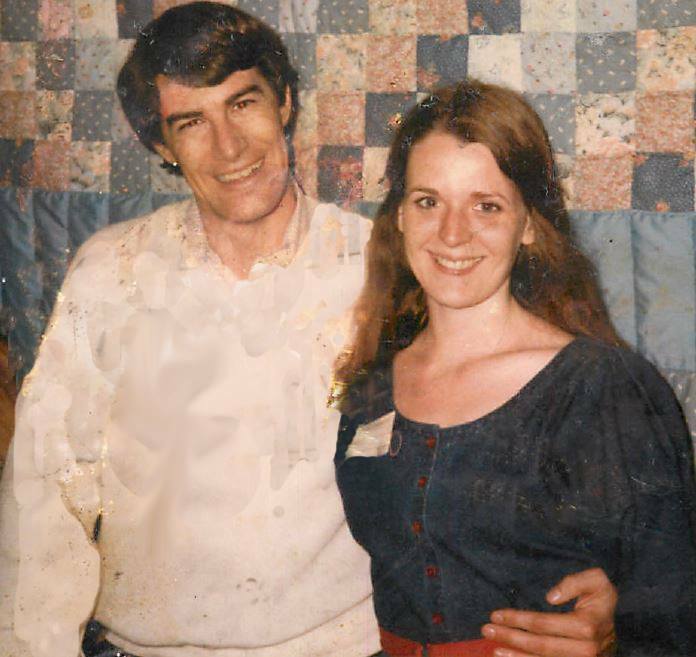 Context of this FB photo: Bob and Doris were just married and back from their honeymoon, and they were speaking at a Presbyterian "Wee Kirk" (Little Church) conference in Montreat, N.C. in October 1985, sharing about the Unreached Peoples and how small churches were likely to be the major force behind mobilizing for agencies to reach the unreached. On that October 1985 day, Bob and Doris collected a bunch of $15.95 gifts towards the purchase of the Pasadena campus. This was also where Bob Coleman began to realize that the small gifts weren't likely to fully fund the campus, and began praying for another way to meet the coming balloon payment of $8.5 million. This was the early genesis of the "Last $1000 Campaign"
Message from Bob Coleman, Founder of The Last $1,000 Campaign and one of the original Board Members: "We've ALL got to get busy now! We likely have only 30 days. (They're doing an unusually short escrow as well, I've been told by insiders, so those pesky donors, again, don't have time to fight it.) But we DO have time! If you care about the campus, contact your friends! Contact any newspapers you know! Send tax-deductible donations NOW to Save the Campus so we can immediately get an injunction to stop the sale. That will cost $100,000, not because of our lawyer but because we have to do a lot of official depositions—of all the board members and senior staff, of many former donors, of former and current staff and board—and the court charges a fee of $2000 average for EACH of those, to pay for a court reporter. Then we have to pay for a forensic audit, because the biggest mystery is still unsolved: how can a board of directors, even one as obtuse as this one, not be able to financially handle a campus that has NO mortgage and tiny property taxes? HOW?? What's going on?" We accomplish a lot together. Our partners are people of the same mind and heart as the Save The Campus Team. Our partners are those who will commit to stand with us as we work to bring transformation and restoration to the US Center for World Mission / William Carey International University Campus. A collaborative community of Jesus followers! Standing with us financially and giving to our nonprofit, Save The Campus and our Legal Defense Fund. In participating in any of these roles please fill out the contact information fields below. We believe God has called us to this purpose and we have committed our time, talent and finances to see the Campus restored.